As E3 2019 looms, there's a lot of talk as to what will be on the Ubisoft line-up, and my money is on Watch Dogs 3. Not only has it been rumoured for a while now, complete with London setting, but also it's been over two years since the last game came out. Is that enough time to make a sequel? Well, the original Watch Dogs came out in 2014, so actually a two-ish year release sequel is looking almost normal for the Watch Dogs series. So could 2019 be the year we get down and dirty with hacking again? It's looking likely. Watch Dogs 3 release date - When is it coming out? 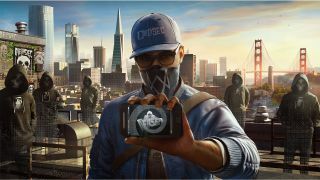 If the rumours are to be believed, the Watch Dogs 3 release date is set for 2019, meaning we're definitely going to see it feature as part of Ubisoft's E3 2019 games lineup. Ubisoft has already confirmed its place on the E3 2019 schedule, with a press conference happening on Monday, June 10 at 13:00 PT / 16:00 ET / 21:00 BST, so stay tuned for some official information then hopefully. Watch Dogs 3 in London - is it really happening? As a British woman, the idea of Watch Dogs 3: London happening is seriously exciting, and not just for the tea and crumpets. And from the sounds of it, it's definitely happening. Not only have Kotaku sources already confirmed it - and the site has a ridiculously good track record when it comes to Ubisoft leaks - but also Ubisoft weirdly patched the ending of Watch Dogs 2 to include a reference to South London locale Brixton. The 10GB patch arrived in early 2017, just a few months after the game's launch, and brought with it new clothing, fixed some bugs, tweaked some systems and generally prepared the game for its incoming DLC. However, it did also adjust the ending of the game. Spoiler warnings for the Watch Dogs 2 ending from now on. You have been warned. The ending remained basically the same, with hero Marcus Holloway and his Dedsec crew still beating their enemies, broadcasting their freedom message to the world and attempting to wake up those still under control. BUT, before the game gives you back control to continue exploring its open-world San Francisco and mop up all the side quests, a short audio conversation plays out, as you can see below, courtesy of YouTuber Frenzy - skip to 2.15 for the important dialogue. The conversation asks whether the message is getting around the globe, with the second person replying that "there are new DedSec cells popping up everywhere. The Middle East. South America. Europe. And not just them... we can't even keep up with all the new hacktivist groups." What makes it even more interesting though, is that the .wav file that's playing isn't named with co-ordinates, which actually lead you to the South London area of Brixton. Watch Dogs 3 gameplay - What do we know so far? Building on the rumour that emerged on the 4Chan boards that it'll be set in London, in terms of Watch Dogs 3 gameplay is that it'll focus more on smaller firearms and knives for combat, but also put a much larger emphasis on hacking. Apparently you'll also be able to choose whether to be a male or female character - like you can in Assassin's Creed Odyssey, Far Cry 5, and Far Cry New Dawn - but the story will stay the same whatever you choose. That's all the details we have so far, but it does pose the question of how exactly a game like Watch Dogs 3 would work in London, particularly if it stays true to life. England has a much bigger knife crime problem than with guns, so staying with pistols and handguns, complimented by an arsenal of knives and other melee weapons would make much more sense. London could also be the perfect place to play around with some enhanced hacking tech. It might not be quite the tech capital that San Francisco is, but we've got plenty of technology going on over this side of the pond too. Could you imagine using your hacking powers to take control of the London Underground? It would be like playing the utterly amazing Mini Metro on a grand, grand scale, but with more bad guys, weapons and a lot less chill. Plus, all those people on their phones screams social interference hacking to me. It's also the perfect place for a bit of political feather ruffling, as is usually the way with the Watch Dogs series. Not only are we in the midst of Brexit, a country divided, and talk of Facebook advertising influencing voters still rife, but at the end of 2018 the European Court of Human Rights actually said the UK government's surveillance regime - including Britain's surveillance programs, methods, judges and laws - actually violate human rights to privacy and freedom of expression. So that's fun. Sounds like a job for DedSec.